him out to the yard yesterday, he didin't like it. Hopefully he will, soon. They are so nice Land-Rich's dreamcathers. Älskar fransk-bulldog-öronen o plyschdressen! DJUR alltså..! din blogg är helt underbar. jag får alltid ny energi av att titta in här hos dig. tack allra finaste du. I love your cat. He is beautiful and if you ever wan tto find a new home for him, I'll gladly volunteer mine. He's a dream. I love your first picture! 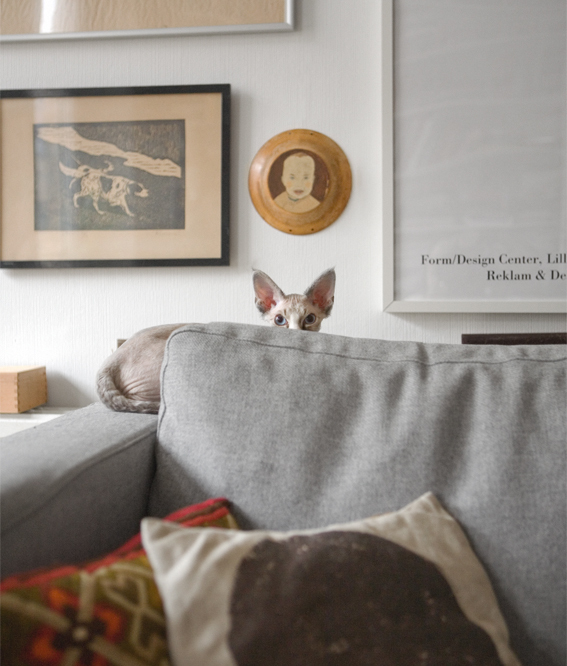 At first glance I didn't see the rest of Hiro's body on the end of the sofa, all I saw was his cute little head poking up, brilliant! So sweet. I love that last picture. You can definitely see he has an interesting personality. His eyes remind me of an old wise man. Hej Elisabeth! Jag blir alltid lika glad när jag tittar in på din blogg (och det är inte bara för att Hiro är med;))! Så fina, överaskande, roliga, kreativa, inspirerande bilder! Erin, he sure is. 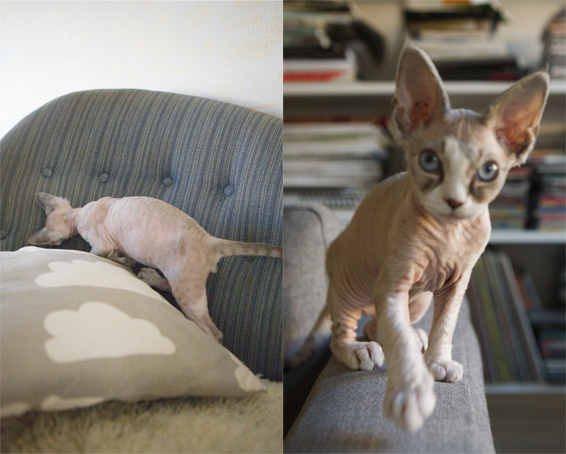 I could never imagne how awesome it would be to have a cat before we had Hiro. He is such a personality, we love. Wow! Good luck leash training little Hiro. What a cutie! Hihihi! He makes my days!!! Very awesome friend! This cat is so you, magical, delicate... I've enjoyed your summer houses posts too. In fact, I am jealous of so much gorgeousness. the first picture is really too funny! Punky funny cat! Oh my gosh, can't wait to see Hiro with his leash on ;)! he is on the hunt for some treasure behind that cloud pillow! he is SO adorable elizabeth! Han är så fin! Vår katt blir alldeles paralyserad av sele och koppel. Det ser ut som om hon skäms. "Naken" älskar hon att kila runt i trädgården men så fort kopplet kommer på sätter hon sig i ett hörn och deppar.